ESPN's Matthew Berry has been saying it for years: Never pay for saves. This season has quickly offered confirmation of that maxim. Several closers already have been injured this year (Aroldis Chapman, Bobby Parnell, David Robertson) and several others are off to very poor starts that could jeopardize their jobs. If you're stuck with a couple of closers who are lame or ineffective or both, you can always choose to forfeit that category altogether in your weekly head-to-head match-ups by deploying hurlers with SP/RP eligibility in the RP slot, or even RPs who have found their way into starting rotations as fifth starters. The best SP/RPs are of course long gone. Guys like Michael Wacha, Andrew Cashner and Tony Cingrani were snapped up in drafts by owners well aware of the value of dual eligibility. Bruce Chen, KC: A long-time favorite among the hybrids. Chen somehow manages to lull offenses to sleep year after year. He struck out seven White Sox in 6.1 innings in his first start this year, and can usually be counted on for decent ERA and WHIP, along with occasional wins. Alfredo Simon, CIN: Filling for the injured Mat Latos, he will likely gain SP eligibility with at least two more starts planned. Six strikeouts and a win, along with a 1.29 ERA and 0.71 WHIP, have him off to a good start, and a run-producing offense could help his case to remain in the starting rotation. Garrett Richards, LAA: The Angels have started poorly for the second straight year, but I'm not buying it for the longer term. Richards won his first start, and could deliver above-average strikeout numbers. 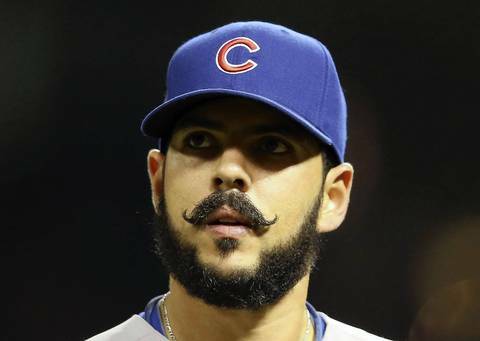 Carlos Villaneuva, CUBS: Yes, the guy with the fancy moustache who took the losses in relief in the Cubs' first two games. He is much better as a starter, as he showed earning the win against the Phillies last Sunday. If that outing of five innings, three strikeouts and no walks doesn't seem like much, it's still better than a 2/3 of an inning pitched with a blown save, which you might get from any number of secondhand closers. * ESPN says to adjust your fantasy expectations on pitchers who have made adjustments in their games. * Bleacher Report wants to know if you picked up James Paxton yet. Who? * Rotoworld highlights the next heir to Mariano Rivera after the Robertson injury: Shawn Kelley. Who?